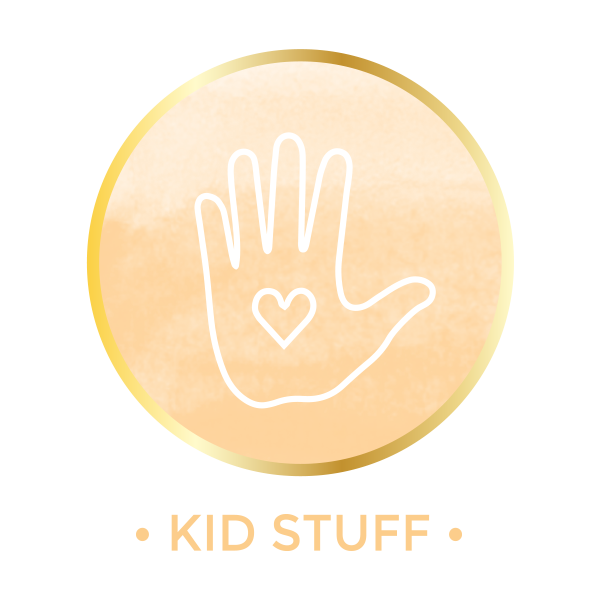 I have a fun printable kid’s Valentine idea for you today and I hope you like it as much as I do. 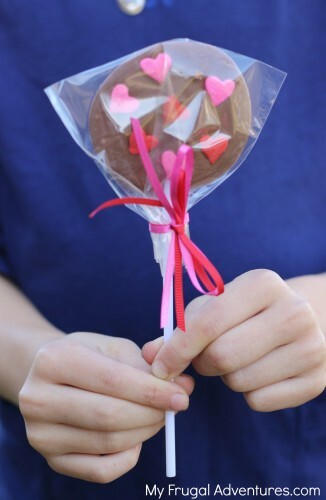 I wanted something that wouldn’t be embarrassing to my little girls (some Valentine ideas are really cute but might say something like “You Make My Heart Go Wild” that they would be mortified to give to a boy in class 🙂 . 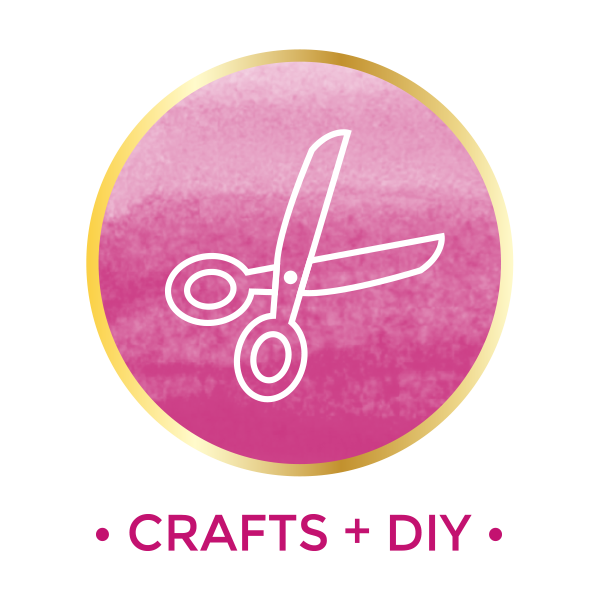 I still wanted it to be bright and fun and colorful and most importantly- simple for this Mom that is crafting 48 of these suckers. 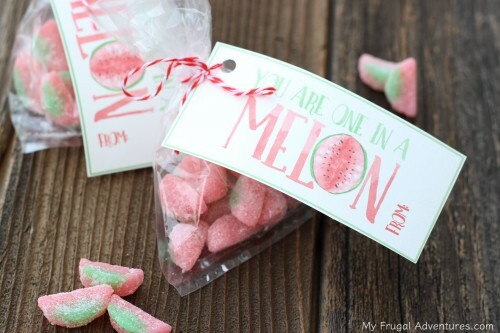 So here goes a cute little Valentine that uses one of our favorite candies- the gummy watermelon. I find bags of these for $1.00 in the Market Pantry brand at Target or Sour Patch makes a version that is slightly less tart and fruitier. 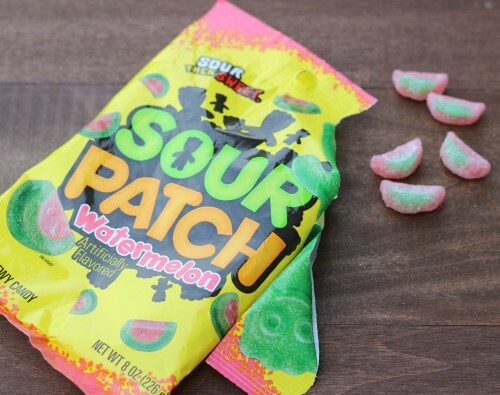 This is hands down our favorite candy. 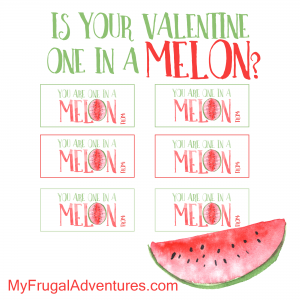 I used the phrase “You are One in a Melon” instead of Million and I think it is really cute and just a little different from other Valentines I have seen. 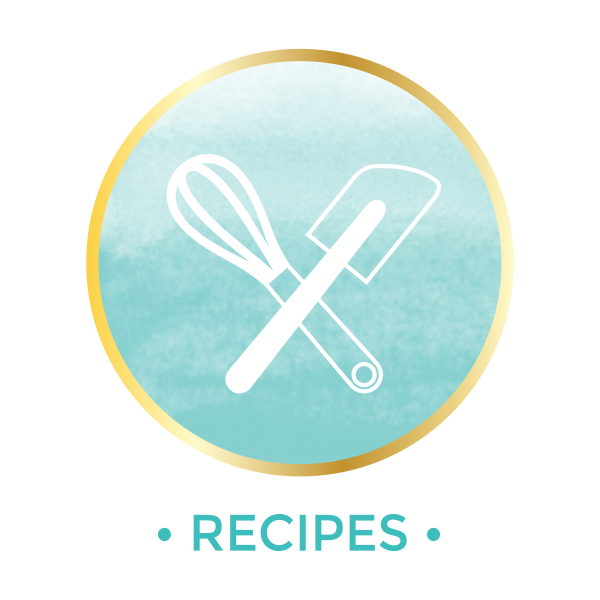 To make these is really simple and fast! You just need to print out the pdf I have included below. You will find 6 per page. I hole punched the corner and attached them to a bag with melon candies. I am sure there are lots of other options too- maybe Watermelon lollipops taped or tied to the label or watermelon lip gloss for little girls or a melon pink nail polish? I was actually thinking these would be a cute and healthy (!) treat for those of you that might have class parties for Valentine’s Day. 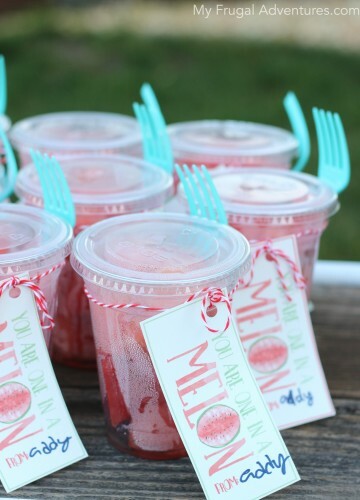 My girls LOVE fresh watermelon and sliced up in a cup with this label attached to the front is festive and a fantastic alternative to a sugary treat. 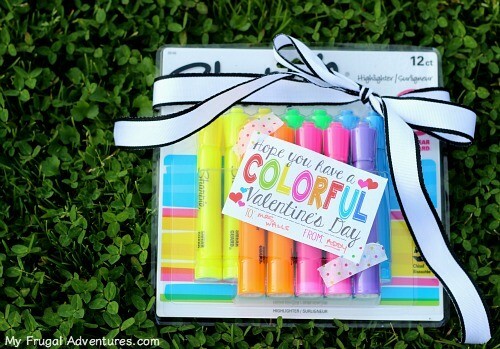 And one other option for those of you that might want to take the teachers a special Valentine. 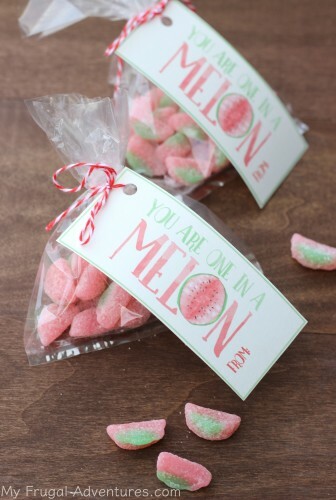 These labels are very fun attached to a Watermelon scented candle or hand soap. I picked this candle up at Bath and Body Works on sale for $10. 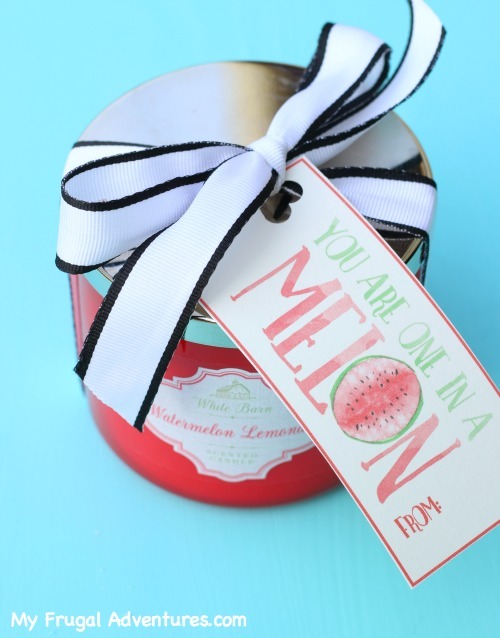 There are lots of other bath products that would be even more economical or a cute mason jar filled with the watermelon candies. I am actually planning to give these candles as little Valentine’s for our ballet teachers and Cheer coach. I think they will be a hit with teenagers. Just something simple and cute to let them know they are appreciated. 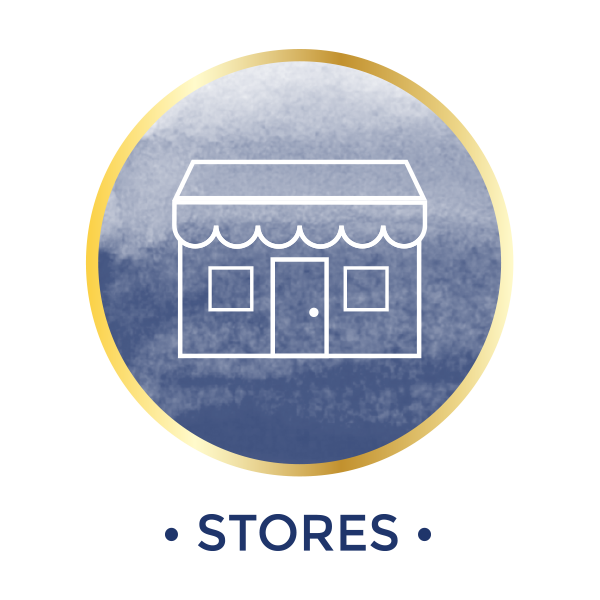 You can print the free PDF file by clicking here. I printed at home with a card stock paper or you can also send these off to Staples to print for about $.50 a page. Please note these are for personal use only. 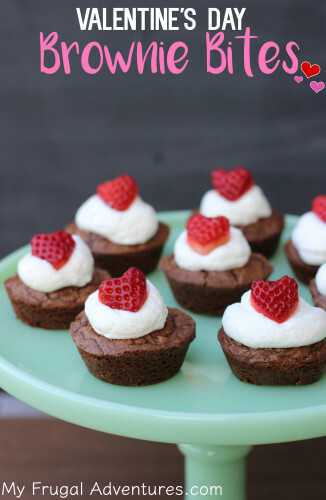 Valentine’s Day Brownie Bites– perfect for class parties! This is darling!! Thank you. 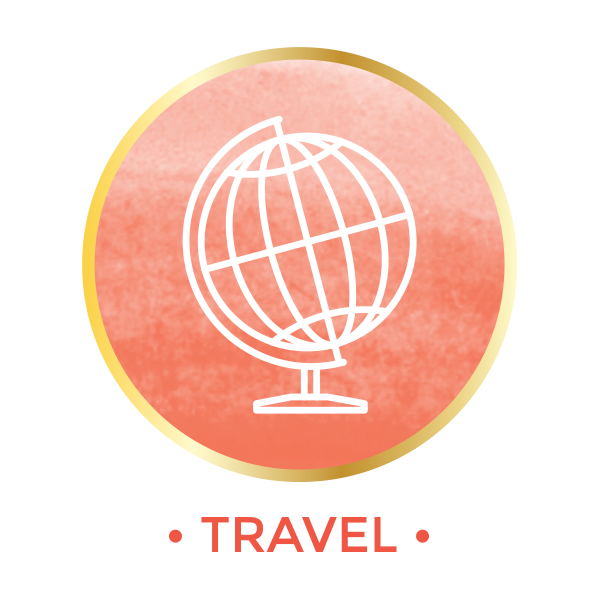 Just a quick question, what font did you use? I love it! What size cups are the fruit cups you have put together above?